I’ve had three babies. All three of them have been different kinds of sleepers – My oldest was a dream, my middle baby was a nightmare and my youngest is somewhere in between. Mr. Napping was unemployed for much of my pregnancy with my oldest and we had to really decide what were needs and wants for our new baby. Big J was our first baby and we had nothing. We depended heavily on hand-me-downs and consignment store finds. We lived in a multi-level townhouse when my oldest was a baby and we used some two-way audio receivers Mr. Napping already had as our baby monitors. They worked and we already had them – if it ain’t broke, don’t fix it – so we didn’t look at baby monitors much. They weren’t in the budget. With my middle little one we started out in a two-bedroom apartment that was less than 1000 square feet and there was no need for monitors. You couldn’t get far enough away to not hear the baby. When he was three months old, we moved into our single-story home and we still didn’t need a monitor. He was (and still is!) such a restless sleeper that it was better if I didn’t have a monitor on him because every movement he made put me on edge… Is he getting up? Is he gonna cry? Should I go get him? We both slept better without a monitor – I wasn’t constantly hovering over him while he was trying to sleep. He expected me to be there every time he stirred and he was terrible at putting himself back to sleep because of it. It didn’t help that I need sleep or I am one grouchy momma. It really was better for both of us. Between my middle baby and my youngest, my sister-in-law had their first baby. They went all out with the changing tables, video monitors, diaper pails and more. I thought it was a little unnecessary… Then we were at my grandma’s house with the whole family and it was loud! Both of my younger boys still napped. Our room was too close to the noise and kept them from getting a good nap unless we put them in the attached apartment my parents were staying in. But we had no easy way to make sure our kids were still sleeping, safe and sound. My brother’s video monitor suddenly seemed like more of a need than a want, or at the very least not unnecessary. We made do with some apps on our mobile devices and tablets, but it meant someone had to leave their device in with the sleeping kids and the apps chewed through the battery! 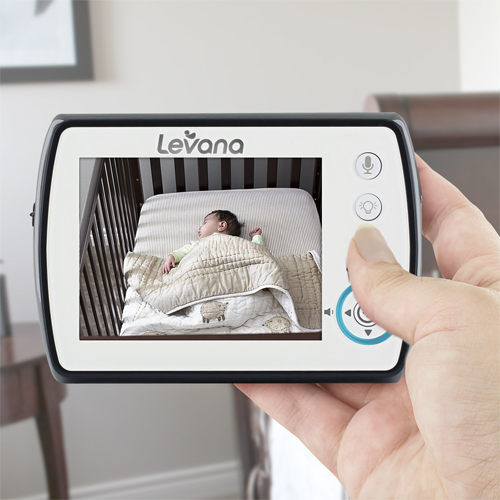 Enter Levana’s Ayden™ Baby Video Monitor. Even though my little Baby N is closer to being two than one, I am so excited to have this monitor now. I know it will be so useful while we are traveling next week! I absolutely love this thing. It has all kinds of features I am so excited about. The most important feature to me, though, was a secure signal – I want to be confident that I am the only one checking in on our children. The Ayden™ Baby Video Monitor offers Private ClearV­u® Digital Signal that is private, secure and interference-free from up to 750 feet away. The picture quality is fantastic on the 3.5 inch screen and there is even an LED Night Vision option to give you a clearer picture of your baby in the darkness. This is amazing and essential for me, as our nursery is incredibly dark even during the day. I love being able to see my baby without having to shine a bunch of light in on him and worry about waking him. The actual picture clarity is even better than this photo. Another feature I was very excited about was the option to use battery or wall power for both the monitor and video screen units. This means we can even take it camping! I am very excited about the freedom that will give me! You can turn on PEEP mode and your monitor and camera will enter sleep mode if it’s quiet. You see what you need to see when you need to see it and don’t use up lots of battery when there’s nothing to check on. This allows for up to 48 hours of battery life before you need to recharge. 1. When my Baby N finds himself overstimulated and tired. When this boy has had enough, he needs his space. Even momma is too much company. The worst case overstimulated scenario has the poor boy in hysterics and cuddles from momma or daddy just make it worse. I like being able to keep an eye on him while he calms himself enough for a snuggle before going to sleep. I don’t have to worry that he’s going to hurt himself or be naughty – he’s climbing all the things these days – while he’s alone in his crib. 2. To check on Baby N before I go to bed. You know what they say – Let the sleeping beast lie! Baby N regularly kicks his blankets off, but not all the time. I love being able to check and see if he needs to be tucked in again without entering the room and disturbing his slumber. 3. In the middle of the night. Baby N gets up usually once during the night, but he’s been sleeping all night more often lately. It’s really nice to be able to check on him when I first hear him fussing to see what he needs. Is he cold? Hungry? Did he just lose his pacifier? It helps me get him taken care of and back to bed faster. The temperature monitoring is a nice feature. My youngest two boys kick the covers off all the time. With the Ayden™ Baby Video Monitor you can check on the temperature in their room and see if they need to be recovered without risking waking them up. There’s nothing worse than checking on them and them waking up just as I’m heading to bed. My boys have usually been asleep long enough they think it should be time to get up and play. Not what a tired momma wants! The smart indicator ring was also something I thought was very cool. The ring around the directional pad will change colors according to the noise level in the baby’s room. You can keep an eye on your baby even when the sound is turned down. This would be a great option for times when your surroundings are loud already and for hearing-impaired parents and caregivers. Two more features are a night light option and a lullaby option that you can turn off and on from the video screen menu. You don’t even have to go into the room. There are three lullaby options and the night light is a calming yellowy-orange color that comes from the top of the camera. There is a two-way communication feature that lets you talk to baby. I am incredibly happy with this monitor. It’s feature-rich, I can keep eyes on my kiddo and I will be able to do more knowing my child is safe. That’s all this momma wants! Enter the giveaway below for a chance to win your own baby video monitor. Get more info and stay up with all the latest and greatest from Levana on their Facebook page. Or check out the Ayden™ Baby Video Monitor and get your own with the button below! This is a sponsored conversation written by me on behalf of Levana. The opinions and text are all mine. Pinky Promise.